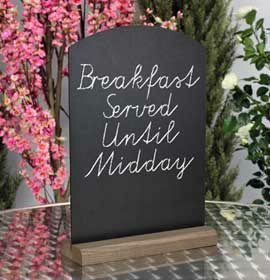 Available in 2 stock sizes, these simple yet stylish table top chalkboards feature our spring-powered ‘grip-action’ bases. Description All your GripChalkers will be sent as individual units by parcel delivery. Your GripChalkers will be sent in two separate deliveries – one by pallet, one by parcel. 3mm ‘High Pressure Laminate’ with round tops as standard. Suitable for traditional chalk and liquid chalk pens. Available in A5 and A4 from stock. Square-top and custom shaped panels available made to order (minimum order quantity 25 and 50 respectively), with or without handle cut outs. Direct-to-surface printed panels available made to order (minimum order quantity 25). Aluminium with silver anodised finish as standard. Spring-powered ‘grip-action’ – simply open by hand, insert panel and release. Suitable for self-adhesive vinyl, ‘polydome stickers’ or pad-printed graphics. Maximum pad-print height: 15mm. Minimum order quantity 50. Available in custom sizes, colours and finishes made to order (minimum order quantity: 100). These bases are suitable for almost any rigid sheet material between 1-4mm thick. E.g. acrylic, PVC, PET and foam PVC. You may also be interested in GripTalkers – simple yet stylish table top menu holders featuring our spring-powered ‘grip-action’ bases.